Effective instructor feedback can be used to increase student learning, provided that students read and apply this feedback, which is not always the case. The current study investigates an approach which may encourage students to read and immediately apply instructor-provided feedback. This is done by giving students the opportunity to submit revised homework assignments, with the incentive of recovering some of the points lost on the initial submission. Students who elected to submit revised assignments had significantly higher final course grades when compared to students failing to submit revisions. They also benefitted in other ways, which are discussed. Despite the vast amount of data collected by faculty every semester as part of their regular teaching load, pedagogical research is not frequently undertaken by educators. Failure to conduct pedagogical research may be due to time constraints, or a lack of motivation and/or reward for engaging in such research. The demands of research-focused academic positions do not always allow instructors to undertake additional research projects to ensure the instruction they are providing is effective. There are numerous issues one can examine for the purpose of gaining a better understanding of student learning and subsequently initiating attempts to improve student learning outcomes. One rarely examined issue facing instructors is the frequency in the failure of students to read and apply the feedback provided to them on assignments (Weaver, 2006). Surprisingly little is known about the impact of instructor feedback on student learning, despite the fact pedagogical research has revealed that feedback is important to overall student success (Black & William, 1998; Hattie & Jaeger, 1998). Throughout the semester, instructors spend countless hours providing detailed feedback to students on assignments with the hope these students will actually read the feedback and obtain the expected benefits (i.e., learn) from it (Yorke, 2003). Unfortunately, this may not necessarily be the case. Frequently, instructors receive student assignments that contain issues for which feedback on how to properly address was provided in a previous assignment. Thus, determining how to encourage students to read instructor feedback remains an unanswered question. In order for instructors’ feedback to lead to improved academic performance and greater course satisfaction, the instructor’s feedback should be viewed by the student as personalized (Gallien & Oomen-Early, 2008), prompt and helpful (Chang, 2009), positively framed, guiding as well as being future-oriented (Getzlaf et al, 2009). Unfortunately these recommendations are only useful if the student actually reads the provided feedback. So how can we, as educators, encourage students to read (and apply) the feedback we provide to them? The present study proposes that allowing students to revise and resubmit written assignments for full credit may achieve this goal. Specifically, this will require that students read the instructor’s feedback and incorporate it into their revised assignments. Further, reading instructor feedback may lead to long-term improvement and more global improvement since basic knowledge such as formatting or citation style and basic writing or grammatical rules will be useful in future assignments and other courses. Data are from three sections of an introductory psychology course (the number of students enrolled in each section ranged from 9 to 25). Limited demographic characteristics were collected to respect students’ privacy especially since no predictions were made in relation to any demographic variables. For each of the homework assignments in the course, students were given the opportunity to revise and submit the assignment (for the purpose of improving their grade) after having received and applied the feedback given from the instructor. Using the Track Changes and commenting features of Microsoft Word, instructors in three introductory psychology courses (1 online environment and 2 face-to-face environments) implemented this revision and resubmission option into their course. Each course used the same thought question assignments and grading rubric, and the instructors provided scaffolding comments (e.g., “How does this help to inform or advance the theory you are describing?”) rather than providing students with the “correct” response. Students completed 4 thought questions (TQs), with each question focusing on a different topic covered during the semester. After having initially submitting the assignments, students were permitted to submit their revisions within one week for additional points, provided the revisions adequately addressed the instructor’s feedback. Overall performance was examined across the three course sections, specifically comparing outcomes for students submitting revised assignments and for students who did not submit revisions. There was no main effect of section, so data from the three sections were collapsed for the analyses reported below (F(2,45) = 1.516, p = .232). A main effect of resubmitting was found (t(42) = -2.945, p = .005), where “resubmitters” were students who revised and submitted more than half of the assignments (Figure 1). These students had a higher final grade in the class (which was mostly based on test performance) when compared to those who did not revise and submit (“non-resubmitters”) (90% vs. 79%). Although resubmitters could have been more intelligent a priori, their grades on their original submissions did not differ (p-values for each of the 4 TQs ranged from .107 to .287), suggesting that they were not a priori more intelligent than non-resubmitters (students who resubmitted fewer than half of the thought question assignments). A significant increase in score was found between the original submissions and the revised submission of those who elected to resubmit that particular assignment (p-values ranging from .0001 to .02), suggesting that students did actually read the instructor provided feedback instructors left and addressed this feedback in substantial ways, ways that made a significant difference on their grades. In addition to the analyses reported above, students were also asked about their experiences in the course that semester in open-ended questions focused on their use of instructor feedback and its perceived usefulness in this and other courses (Appendix 1). Of the students who responded to the open-ended questions, most seemed to read and genuinely appreciate the feedback they received. Many evoked their appreciation for detailed and thought-provoking feedback as well as the opportunity to resubmit their assignment after addressing the feedback, though they all reported reading instructor feedback in all of their courses (when given) regardless of the opportunity to resubmit. 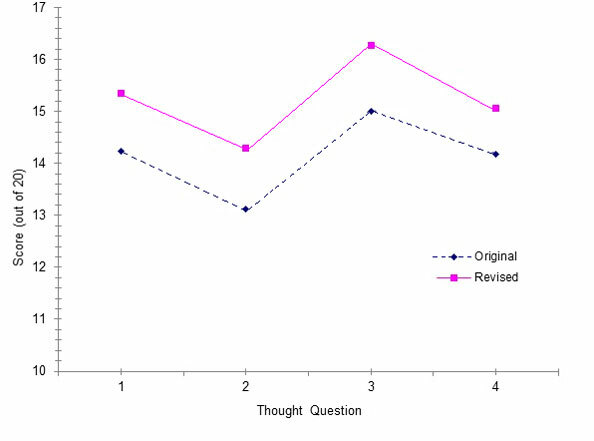 Despite the difference in topics addressed in the 4 TQs, students’ improvement were very comparable between the original submission and the resubmission scores. As a result, it was concluded that the ability for students to learn from effective instructor feedback exists. Therefore, encouraging students to not only read but also immediately apply this feedback appears to be a win-win situation for both students and instructors alike. More specifically, students improve their understanding of the material which is reflected in their improved grades. .Instructors benefit by seeing students improve, and their perceived lack of student appreciation for the time spent invested in developing detailed feedback is diminished because students are taking advantage of their feedback and validating the time and effort instructors place in providing this valuable feedback. The qualitative data obtained do present a pattern: students enjoy receiving well-constructed feedback and take the time to read and apply it. There is likely some selection bias in terms of which students responded to the optional survey of open-ended questions, but the picture is optimistic. Importantly, allowing students to resubmit their assignment may shift the focus in the course from grades to learning as both students and instructors now see the assessment as another opportunity for learning. This view of assessments as further opportunities for learning seems to be gaining in popularity (interested readers can consult Epstein, M. L., Lazarus, Calvano, Matthews, Hendel, Epstein, & Brosvic, (2002) for an example of this approach during testing). One limitation of the present study is that it cannot establish a causal relationship between reading and using feedback and grade increases. A true experiment with students randomly assigned to either resubmit or not resubmit would allow us to make causal statements about the effect of reading and using instructor feedback. Additionally, it is possible that some students read the instructor feedback but elected not to resubmit the assignment (for any number of reasons). In spite of these limitations, allowing students to resubmit assignments does appear to motivate students to read the feedback left by instructors. In addition, research suggests that most students desire feedback from instructors, especially if the feedback is balanced with both positive and negative comments (Weaver, 2006). Since these are the kinds of instructor comments that are most likely to read by students (Ackerman & Gross, 2010), instructor feedback can be used to enhance student learning in other areas such as written communication (or other so-called “soft skills”, which employers desire). For example, writing skills could be improved by allowing students to complete large-scale projects in a piecemeal fashion and giving them feedback along the way, allowing them to learn and master the skills necessary to complete a larger-scale project. Our small-scale investigation warrants further consideration by instructors who wish to encourage students to read and apply the feedback they receive on assignments. It suggests that students may benefit from the opportunity to apply instructor feedback by resubmitting assignments and transforms the assessment itself into another opportunity to learn. Ackerman, D.S. & Gross, B. L. (2010). Instructor feedback: How much do students really want? Journal of Marketing Education, 32(2) 172-181. Black, P. & Wiliam, D. (1998). Assessment and classroom learning. Assessment in Education: Principles, Policy & Practice, 5(1), 7-74. Chang, N. (2009) Can students improve learning with their use of an instructor’s extensive feedback assessment process? International Journal of Instructional Technology and Distance Learning, 6(5), 49-63. Gallien, T. & Oomen-Early, J. (2008). Personalized versus collective instructor feedback in the online courseroom: Does type of feedback affect student satisfaction, academic performance and perceived connectedness with the instructor? International Journal on E-Learning, 7(3), 463-476. Gertzalf, B., Perry, B., Toffner, G., Lamarche, K. & Edwards, M. (2009). Effective instructor feedback: Perceptions of online graduate students. Journal of Educators Online, 6(2). Hattie, J. & Jaeger, R. (1998). Assessment and classroom learning: A deductive approach. Assessment in Education: Principles, Policy & Practice, 5(1), 111-122. Richardson, J. C. & Swan, K. (2003). Examining social presence in online courses in relation to students’ perceived learning and satisfaction. Journal of Asynchronous Learning Networks, 7(1), 68-88. Ury, G. (2004). A comparison of undergraduate student performance in online and traditional courses. Journal of Computing Sciences in Colleges, 19(7), 99-107. Weaver, M. R. (2006) Do students value feedback? Student perceptions of tutors’ written responses. Assessment & Evaluation in Higher Education, 31(3), 379-394. Figure 1. Overall performance on each thought questions for the original submission and resubmitted assignments. Bibia R. Redd is a lecturer in the Psychological Sciences Department at University of North Georgia, Gainesville, GA.
Lynne N. Kennette is a professor of psychology in the School of Interdisciplinary Studies and the program coordinator for General Arts and Science-Liberal Arts at Durham College, Oshawa, Ontario, Canada. The authors would like to acknowledge the mentorship of Dr. Margo Bowman, Wayne State University.